Do you know where you want to focus your home or condo search? 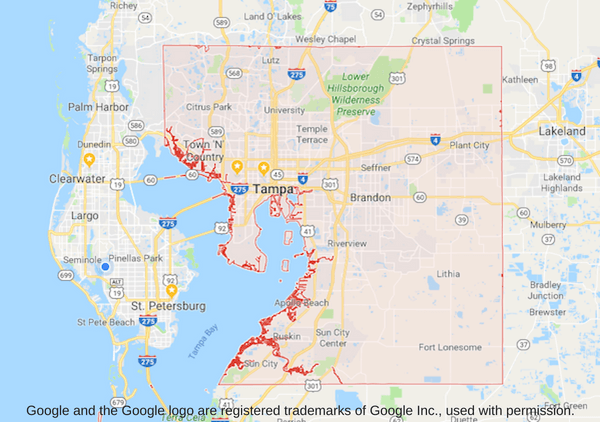 If you are looking in a certain area to be close to work, school, or family, a Tampa Zip Code search can be very effective. We've made this easy with the Zip Code list by County and City below. Click on any zip code and it will take you to all the current home and condo listings for that zip code. Want to limit your search to a particular price range? Just click on the REFINE RESULTS at the top right of the search results and pick a price range. Want to target your search just to single-family homes or just condos? No problem, just click on the REFINE RESULTS, and then at the bottom of the Search Criteria panel on the left go to the bottom and click on the Advanced Search Form. 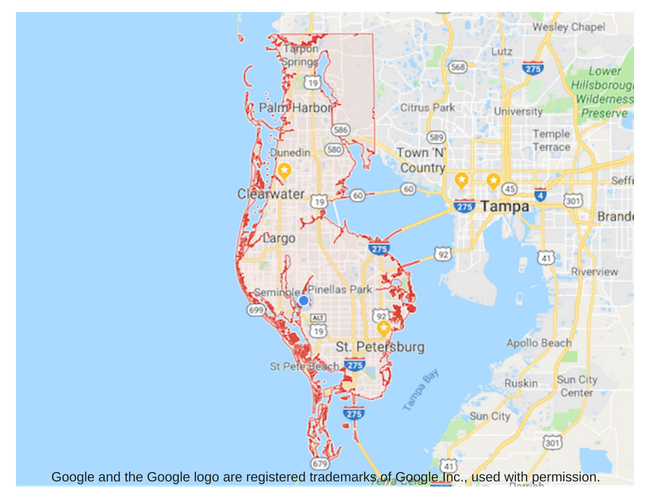 Pinellas County is the westernmost section of the Tampa Bay area located between the Gulf of Mexico and Tampa Bay. It's a great choice if you are looking for beachfront condos or waterfront condos or homes. Belleair Florida is one of the most luxurious neighborhoods in Pinellas County. Strong zoning laws are in place to protect homeowners in this exclusive community. This small strip of beachfront homes and condos is located between Sand Key and Indian Rocks Beach on the barrier islands of Pinellas County. Belleair Bluffs offers several waterfront communities on one of the widest sections of the Intracoastal Waterway. Belleair Shores is a short strip of beachfront condos just south of Belleair Beach. Clearwater Beach is consistently voted one of the most beautiful beaches in the world by numerous respected publications. The 33767 zip code includes Clearwater Beach proper, Sand Key, and Island Estates. Many of the best beachfront and waterfront options are condos. Clearwater is one of the largest and most diverse areas in Pinellas County. Dunedin has a quaint village-like feel and is located in the coastal areas of northern Pinellas County. It is close to Honeymoon Island State Park. It is known for its great restaurants and art festivals. This coastal town is known for its natural coastal beauty and as a haven for local artists and artisans. It is located on scenic Boca Ciega Bay in the southern part of Pinellas County adjacent to St Petersburg and South Pasadena. Gulfport is also home to Pasadena Point Estates, one of the area's most luxurious gated waterfront master-planned communities. Indian Rocks Beach is a popular Gulf Coast beach area just south of Sand Key and Belleair Beach. It has beachfront condos, waterfront condos, and many waterfront homes. It is less crowded than Clearwater Beach and residents love the Old Florida feel of the community. Indian Shores is another "Old Florida" beachfront community on our Gulf coast. It also has a good selection of beachfront condos, waterfront condos, and many waterfront homes. Largo Florida offers an amazing array of city-run parks and recreation facilities and events. The Central Park Performing Arts Center offers a wide variety of concerts on a regular basis. Outdoor activities include golf, aquatics, parties and rentals, and childcare/camps. Check out the new City of Largo Website to learn more. Largo offers a wide variety of Single-Family Home options or low-maintenance living Condo Options. Madeira offers a wonderful stretch of beach just north of popular Johns Pass. It has Condos and Homes with great views and easy access to Johns Pass. Oldsmar is a popular coastal area at the very northern tip of Old Tampa Bay. Ozona is located on the Gulf coast just south of Palm Harbor, and just north of Dunedin. Palm Harbor offers access to lots of great shopping options and easy access to Tampa. Pass-A-Grille is the quintessential Florida tropical beach community. Ask a native of the area about their favorite beach, and they are likely to tell you Pass-A-Grille. The Redington Beaches are just north of Madeira Beach and Johns Pass. The Redington Beaches include North Redington Beach, Redington Shores, and Redington Beach. Redington is home to the very popular Tides Beach Club Condos and other wonderful Beachfront Condos. Safety Harbor is on the north-western shores of Old Tampa Bay just west of Oldsmar. It is home to the very popular Safety Harbor Spa. Seminole Florida is known for its schools and easy access to nearby Indian Rocks Beach and Indian Shores. It also offers easy access to some great parks like Lake Seminole Park, Boca Ciega Millennium Park, and the Fred Marquis Pinellas Trail. Enjoy living in a Seminole Home of Seminole Condo. South Pasadena is a waterfront community on the northern point of beautiful Boca Ciega Bay. It is home to two popular waterfront communities, Harbourside, and the 55+ Bay Island Group. St Pete Beach is the southernmost of the Pinellas Gulf Coast Beaches. Besides the beautiful sandy white beaches, it has a great selection of local restaurants. It also offers easy access to downtown St Petersburg and popular Fort De Soto Park. Downtown St Petersburg offers an amazing array of dining and entertainment choices. Visit the Chihuly Collection, the Dali Museum, or the Museum of Fine Arts. Take in a play or concert at the Mahaffey Theather. Dine at one of the dozens of local restaurants along Beach Drive. The Downtown St Petersburg Condos give you easy access to all that the downtown area has to offer. St Petersburg offers a huge assortment of Home Choices as well as Condo Options. Tarpon Springs is the northernmost community in Pinellas County. This waterside community is famous for the Sponge Docks area with a huge variety of Greek dining options. Tierra Verde is the southernmost of the communities on the Pinellas Gulf Coast. Enjoy waterfront views of the Gulf of Mexico or Tampa Bay. Tierra Verde also offers easy access to Shell Key, and Fort De Soto Park. Treasure Island offers both Condos as well as Single Family Homes. Treasure Island is one of the lower beaches just north of St Pete Beach. One of our favorite outdoor music spots is Ricky T's on Treasure Island. Hillsborough County is at the center of the Tampa Bay area. It is home to Tampa Florida, Channelside, and all of its suburbs. There are also areas with newer homes like Lutz, and waterfront communities like Apollo Beach. Apollo Beach is a great choice if you are looking for a waterfront property on the coast of Tampa Bay. It also features some wonderful master planned communities. Lutz is a growing area on the border of Hillsborough and Pasco County. Pick from an established community or one of the newer subdivisions. Enjoy wide open spaces, beautiful lake homes, rural areas in Odessa. Odessa is also home to Starkey Ranch, one of the newest and largest master-planned communities in the Tampa Bay area. Tampa is the economic center of the greater Tampa Bay Area. It is also the center of cultural events, shopping, and fine dining. Learn more about Tampa and its suburbs. 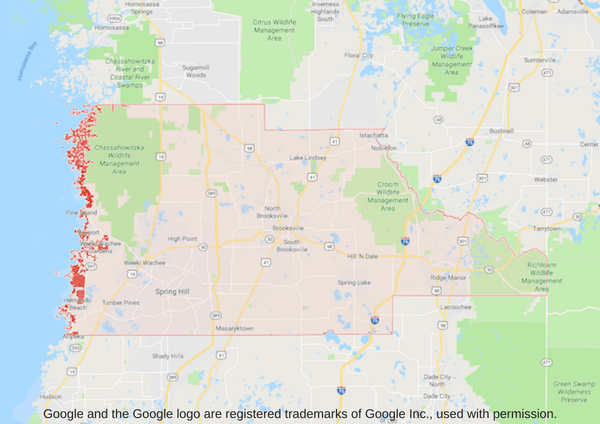 Pasco County is located just north of Hillsborough County, and south of Hernando County. Portions of Pasco are on the Gulf Shores. Port Richey and New Port Richey are popular waterfront cities on the Gulf coast of Pasco County. Land O Lakes and Zephyrhills are popular inland cities on the southern border of Pasco. Portions of Lutz and Odessa straddle the border between Pasco County and Hillsborough County. 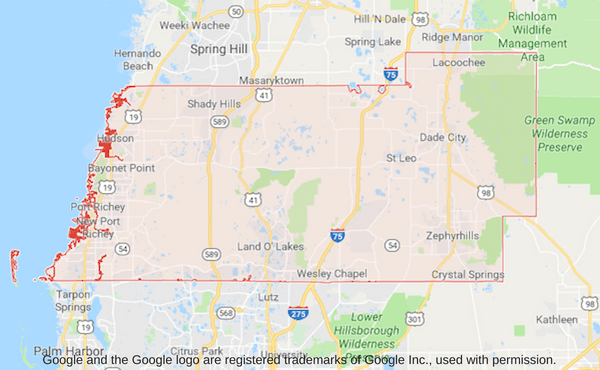 Hernando County is the northernmost of the counties that make up the Tampa Bay Metropolitan Statistical Area (MSA). It offers a great getaway from city life with such natural wonders as Hernando Beach, the Weeki Wachee Springs, and the Chassahowitzka Wildlife Management Area.